Do you find yourself constantly buying bottled water and just throwing the bottles away? You can avoid this problem altogether with the purchase of a countertop water filter. We’ve put together this countertop water filter buying guide to help you out! These devices either attach to your faucet or sit on your counter and deliver pure, clean water without all of the harmful contaminants. Let’s look at some of the things you should know before you shop for a filter. Material: This refers to what the water filter system is made of. Most are made of plastic or stainless steel, and some are made of alkaline. Plastic is more lightweight but stainless steel is more sanitary. 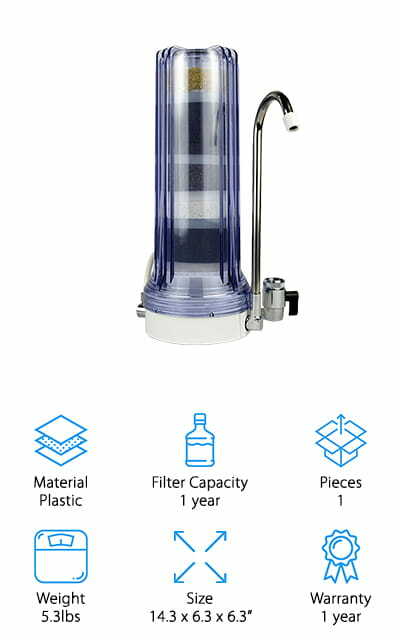 Filter Capacity: How long can the filter go without needing to be replaced? This is measured in either gallons, years, or sometimes both. A longer running filter decreases your costs even more drastically because you won’t have to replace it as often. Pieces: Some water filtration sets come with multiple filters or other elements. Some come in complete kits with a lot of extras. This is a measure of the stuff that comes in the package with the filter! Weight: How much the filter weighs is important for figuring out where it will go on your counter and how often you’re going to be moving it. Faucet filters weigh much less than ones that sit on your counter. Size: Also a factor for determining where the filter is going to sit on your countertop. You want a filter that’s small enough to fit in your space and won’t take up all the room on your counter. Warranty: This protects you against defects in the process of making your filter. Many companies will refund your money or replace a defective product without any hassle if you have a warranty on it. Longer warranties are better, of course! So now that you know what you’re looking for, let’s get to the countertop water filter reviews! We’ve picked over the vast selection of water filters and filtration devices to bring you the ones that perform the best, no questions asked! Check out our top pick and budget pick first to get an idea, and then look through the rest of our list to find your perfect filtration system! Perfectly clean, eco-friendly water solutions are just a click away! 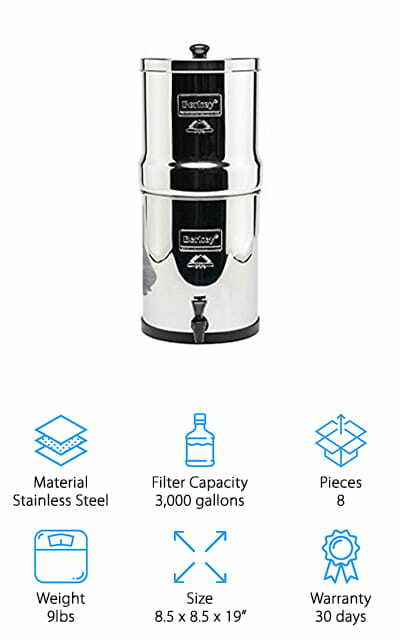 Big Berkey makes our pick for the best countertop water filter! 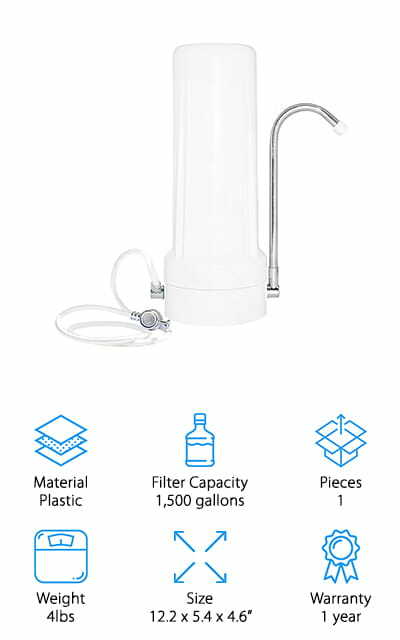 The Big Berkey Water System comes with two filters so you won’t have to replace them right away, as well as two fluoride elements that filter only fluoride out of your water. That’s a great value for the price! The unit is stainless steel and holds over two gallons of ready-to-go, purified water at one time. You don’t have to wait for it to work! Each filter has a capacity of 3,000 gallons, and they remove even such chemicals as herbicides and organic solvents. This unit looks great and is effective at purifying and cleaning up your tap water. It’s perfect for a large family! All of these features combined make this the best countertop filter on our list and one that we’d definitely recommend you try out! Why break your bank with bottled water when you can have all the benefits at home? The Ecosoft Water system has a huge capacity! 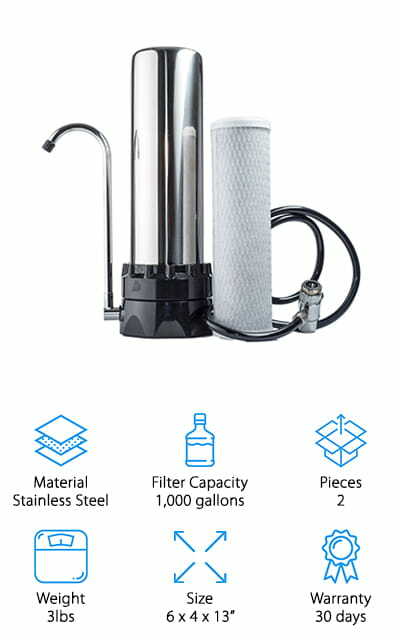 It’s affordable and comes with all the things you need to install it yourself, making it our choice for the best cheap countertop water filter. It doesn’t require a plumber to install or any costly drilling. It will pay for itself in bottled water costs within the first few weeks of use! The filter uses activated carbon to purify your tap water and remove chlorine and lead, as well as pesky sediment that gets mixed into your water. Not to mention the colors it comes in: There is a black version, a white version, and even a mango color to help match your kitchen décor. We can’t recommend this filter enough! We love the mango-colored option especially, and the fact that it’s a carbon filter – making your water pure the old-fashioned way! This set comes with seven individual pieces, which makes sure that you’re going to have everything you need! The Home Master system has a three-stage filtration system, which ensures that your water is free from all the harmful things you do not want to put in your body. It’s compact so you can save as much space as possible on your countertop. It is lightweight, and what makes this filter really unique is the portability! Take it with you on your travels to get purified, clean water out of every hotel tap you come across. It only takes a minute to install and is hassle-free. It uses a granulated system to filter things out, which has worked for people for generations back – why fix something that isn’t broken? It comes in black or white options, and the company boasts that this filter removes up to 93 percent of all contaminants and other unwanted substances, especially ones like fluoride and chlorine. We just had to include it in our countertop water filters reviews! This small filter is amazing. This alkaline filter from APEX comes in six different color options: chrome, white, black, green, red, and blue! We loved that it will pretty much match your kitchen no matter what colors you use. It attaches quickly and easily to your faucet and works to eliminate a lot of the cost and environmental damage associated with water bottles. It removes tap water contamination right at the tap! It includes all the hardware you’re going to need to install it and you don’t need to call a plumber or have it drilled into your plumbing. It’s a perfect match for our best countertop water filters reviews. This is an environmentally friendly option for getting pure water right in your home! The on-faucet design makes it a simple device to use once it’s installed, and that’s only going to take you a few moments! Plus, you won’t forget to use it if it’s attached to your water source! 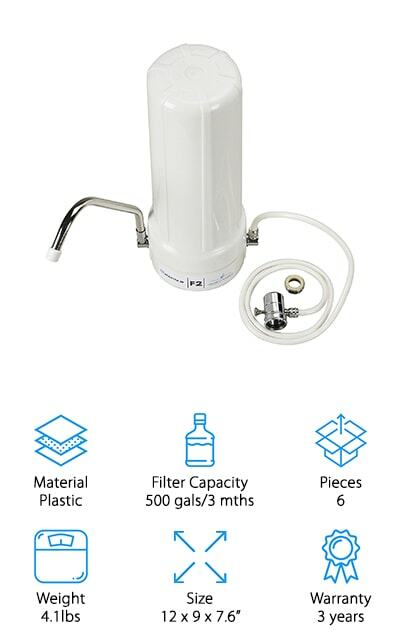 This filter is unique because of the versatility in its use – you can attach it to a faucet, or else purchase a kit to convert it for under-the-sink mounting. This makes it really useful if you have limited counter space or want a more integrated filtration system. The filter can last up to a year, or 1,500 gallons – whichever comes first. It also filters out all chlorine, arsenic, asbestos, and other nasty chemicals, leaving you with pure water that tastes great. If you don’t like it, you can return it for a full money-back guarantee for 30 days. The amount of stuff this filter claims to clear out is amazing, and we’ve definitely recommended it! It’s climbing up the list as one of the best countertop water filters for sale. The ability to mount this system under the sink is something that really appeals to us – the different ways you can use it really make it stand out. The CleanWater4Less system has no cartridge or filter – which makes it unique and amazing on our list! It attaches right to your faucet without the use of any tools, drilling, or outside help. It thoroughly filters your tap water to get all the chemicals and contaminants out. Are you tired of paying so much for bottled water? Why not make an investment in a home assurance that you’re getting the purest water without making all the plastic waste for the environment? This is a best rated countertop water purifier for a reason – it does what it says it does, and it’s easy to use with no frills or hassles. Not to mention the affordable price! We love it for the price and how well it works. Even without a filter, it still works amazingly well, and we cannot recommend it enough! Keep fluoride, chlorine, and harmful chemicals out of your body and out of your mind with this filter! Our list of the best countertop water filters wouldn’t be complete without the BluPure System. 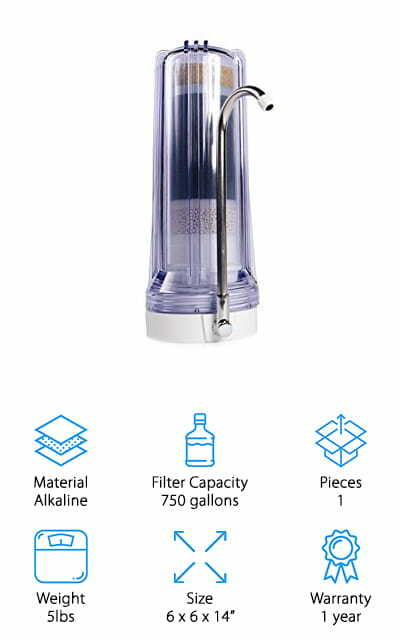 It uses 13 separate purification stages to get you the best-tasting, cleanest water possible. The filter is BPA-free and lasts for up to a year, depending of course on how much you use it. It filters out harmful contaminants like sediment and chlorine, and all of the chemicals that make the water cloudy and undrinkable. 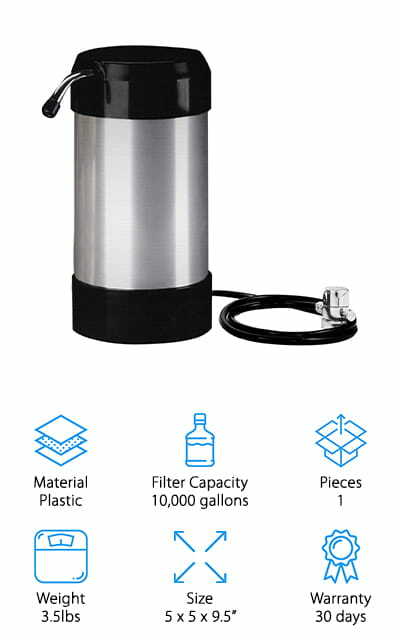 This filter eliminates the need for bottled water entirely! It’s easy to install and use, and comes with everything you need to make the unit effective. So why wait? Start drinking purer water today! There’s a 1-year warranty on the unit, so there’s no risk in trying it out just to see! This easy-to-use filter could be what you’re missing in your life. Plus, it will save you trips to the recycling center! We think that alone makes this something that you just have to try out! 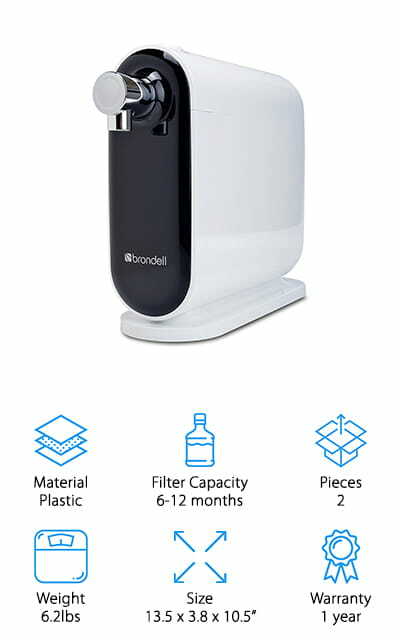 The Brondell filter has a unique design, but it’s really affordable and easy to use! It has a three-stage filtration system to filter out impurities and other things that contaminate your tap water. It has no storage tanks to maintain and uses no electricity to run. The filters are easy to obtain online and replace, but they only need to be replaced every year or so. The long life of these filters makes us really like them! This design fits really well in your kitchen sink, as it’s compact and will still allow your faucet to move from one side of the sink to the other. Our countertop water filter reviews wouldn’t be complete without it! The filtered water dispenses with just one touch, allowing even the smallest hands to get pure water. It leaves out all the fluoride, chlorine, and pesticides that might have found their way into your water – and you get only the great-tasting good stuff! Our best countertop water filter reviews wouldn’t be complete without including this Lake Industries Water Purifier! The company boasts that this filter removes about 97% of chlorine and other chemicals that have a bad taste or bad odors. That’s the power of the 10-micron carbon block filter! It takes the water directly from your kitchen sink and removes all of the organic contaminants, leaving your water tasting great! It’s perfect to use for cooking, or for making tea and coffee - don’t take the risk! Cook without the chemicals just in your water. The filters are inexpensive and easy to get online, making this a long-term investment that will pay off before you even have to replace the filter. This thing looks sleek, as well – it’s a large stainless steel machine that will look great on any countertop. You don’t have to sacrifice function for style! Try it out today to eliminate your water bottle costs and help the environment! NutriChef makes an amazing device with their countertop filter. 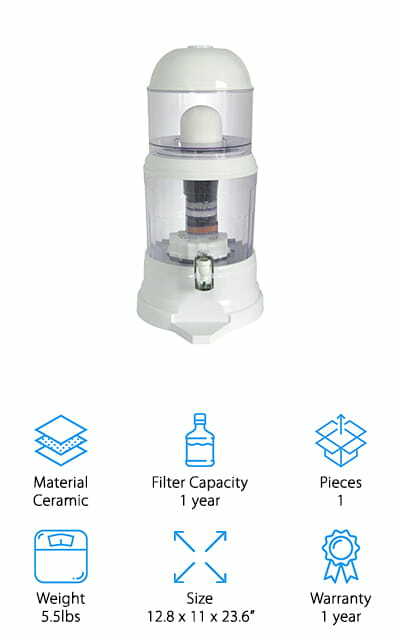 There are five stages of its unique filtration process. It leaves you with water that is not only filtered, but purified, mineralized, alkalized, and magnetized, to take out every last thing that you don’t want in your water. This is the king of the countertop water purifier reviews – it does so much, and takes the job of providing you with clean water very seriously. The system is completely BPA-free and good for the environment. All you have to do to use it is to pour tap water into the top of the device and dispense pure water from the bottom. It’s a pretty amazing process. This device is lightweight and easy to move if you need to. And the best part? They’ve thought of everything! 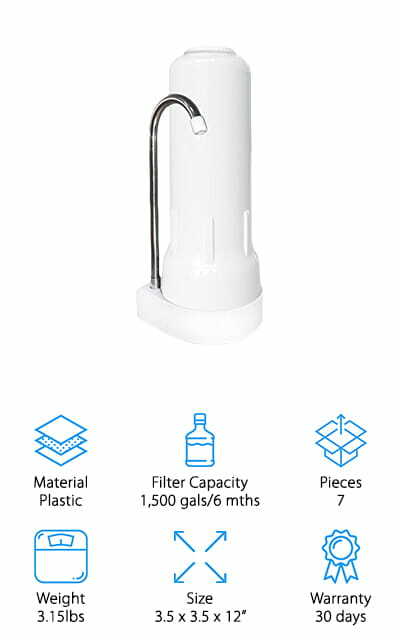 The spigot that dispenses the water even has a drip catcher to make cleanup extremely easy! It doesn’t get much better than the NutriChef!